Silver denarius, 18mm, 3.11gm, issued 15-13 BC. Lugdunum mint. Obv: AVGVSTVS DIVI F, Bare head facing right. Rev: IMP X, Emperor seated on platform receiving olive branches from two soldiers standing before him. References: Sear 1609, RIC 165a, BMCRE 445, RSC 133. 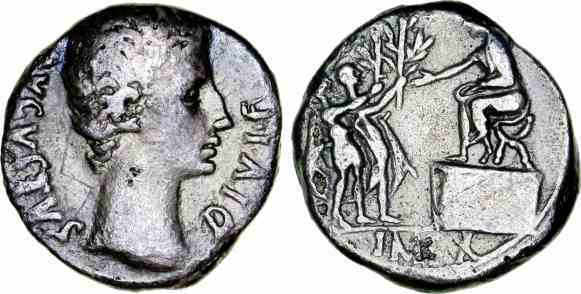 The two 'soldiers' on the reverse undoubtedly represent Tiberius and his brother Drusus, responsible for conquering Rhaetia in 15 BC, when Augustus was proclaimed Imperator for the tenth time (IMP X).